Pop music is today very much an international music language and the Swiss pop scene is thriving. Helvetic electronic music from the likes of DJ Antoine and Remady have gained a worldwide reputation, while Swiss acts as diverse as The Dandies, Neue Deutsche Härte and Swiss mathcore band Knut have all received mentions in Music Week magazine. Swiss Christian music now has its own international hitmaker, at least on Cross Rhythms radio. daFOO has made it to the towering heights of the Cross Rhythms playlist with three singles: "You Lift Me Up", "Cryptical" and "One In A Million", all set for maximum airplay in the coming months. So who is daFOO? He was born David Bhend and got the name daFOO as his Swiss nickname is Dävu, which sounds a bit like his current moniker. He was born in the small town of Aarburg, which is 64km from Zurich. He spoke about his upbringing. "I grew up in a very strict Christian home. Even the breast milk was a 100 per cent organic Christian religion! In my childhood I had a strong black/white world view. Everything that did not fit the church culture I was growing up in somehow was occult to me. So there was not much that didn't affect my daily life, even when the breast milk was a 100 per cent organic Christian! As a boy you love to do silly things. Things that just make fun. But when you were told all things fun are evil, somehow you believe you sold your life to the Devil! For example I was told, rock'n'roll music is from the Devil. Today I know why I had so many encounters with the enemy of God instead of God. So what is it for? Is this a 100 per cent Christian organic breast milk? Faith is more a process of realising that I'm God's child. It grows through a deep, deep conviction that I'm his son! This is what I am." daFOO's involvement in music started early on. He remembered, "I'm the youngest of 11 children. We had an old organ in our house. This organ was kind of ruined before I started playing. But it still worked. I started playing and singing at the age of 10 or so. After the break with my religious background, I started listening to '70s hard rock and '80s metal. One day I started listening to U2. I was fascinated, tried to imitate them and started playing in bands." 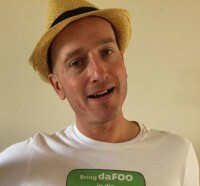 In 2015, daFOO began releasing a string of singles. He plays guitar and keyboards on most of them and "Cryptical" and "One In A Million" were his first self-produced projects. He plays both church organised events and non-Christian venues. "I play wherever people love my music." His faith is central in his music making. He affirmed, "It's THE essence of what I'm doing. Most of my songs came out of my personal morning worship sessions." A year ago he enjoyed a radio hit all over Switzerland with the single "40 Days". Now he's planning the release of a single with American rapper Benjah. daFOO also plans to release an album at the end of the year. The singer has done quite a bit of travelling including to Australia, the USA and Ireland, astonishingly "around 20 times so far." He said, "It's interesting to compare English speaking countries. I would say: 'You're one but you're not the same.'" Finally, I asked daFOO what spiritual lesson he had learned in the last year. He replied, "My daily lesson is to humble myself but not to 'kill' myself. By which I mean instead of focusing on my weaknesses and failings, I remember that I am made in God's image and that he crowned us with glory and honour. Because Christ paid the price of our sin, we can see ourselves as God sees us. As his child I give glory to the Father in thinking and living BIG. The song 'One In A Million' deals with such issues."